Oh oh... I have completly forgot to tell you, that the "C" replace a part of the W1 path box. So you have to open the NSC and edit that. Credits to skawo for creating the "Use inventory item with SELECT" ASM Hack! Btw skawo thanks. You're a lord. ALL HAIL skawo! Sorry for the hiatus on OST and other stuff, but here is 2 things reffering to Newer Starshine's titlescreen! This is my FAVORITE theme in the hack so far. Its soooo good!! From where is that fireball? From a fire piranha plant? Oh, that Jyotyu seems good. But I'm not found where is the thread which teachs put images on loading screen. The most close is in the Changing level names, but is not what you made above. Could you help me? Development has re-started! (after having a tiny hiatus...) Please remove the hack from 'Finished Hacks' if you're a mod! Progress is about 21%! Great! I was sad when you cancelled it. Just because I needed a fresh video to look at on my YouTube channel, here's another theme! It will be the overworld theme from Super Mario Land 2! 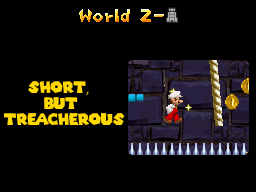 Here it is, World 2 Beta! Read the 'Readme' for more info.